What is this Novation Agreement template for? 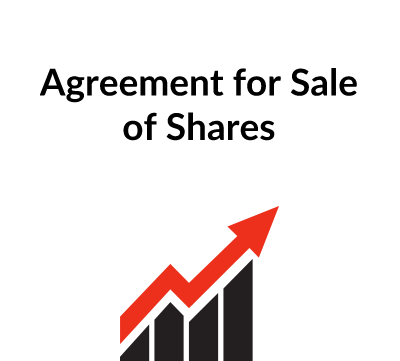 It is for use when a company is transferring its business to another company and, as part of the sale, it is transferring its customer contracts to the buyer. 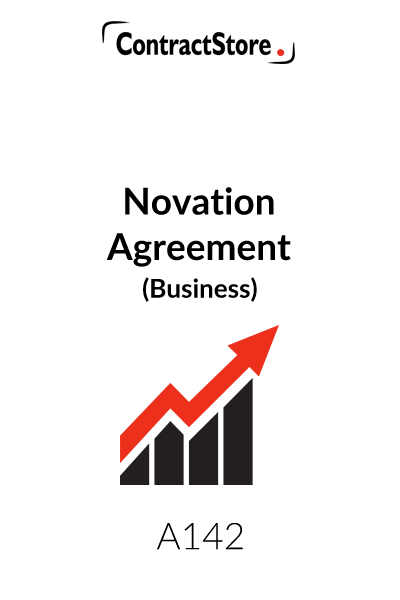 A novation agreement, as the name suggests, creates a new contract between the customer and the buyer which is essentially the same as the previous contract between the customer and the seller. As a result, all three parties – seller, buyer and customer will sign the novation agreement. Sometimes there is an extra clause which confirms the financial position between seller and customer at the date of the novation. 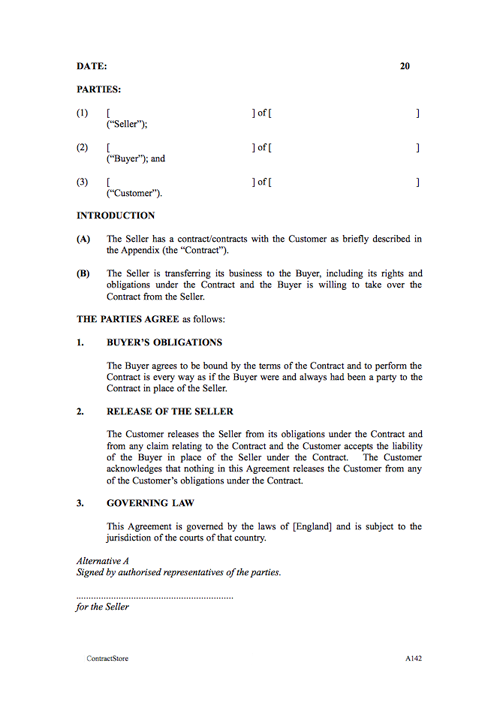 The purpose of this particular Novation Agreement is to formalise an arrangement where a company (the “Seller”) is selling its business to another party (the “Buyer”) and, as part of the transaction, the Buyer will take over the Seller’s contracts with its customers. All the rights and obligations of the Seller under the contract with the customer are transferred to the Buyer and the Buyer, by virtue of the Novation Agreement, replaces the Seller as a party to the contract with the customer. Each customer will be asked to sign a novation agreement in respect of its contracts with the Seller. As will be seen, the Agreement is quite short and is reasonably straightforward. The Introduction refers to the underlying transaction between the Seller and the Buyer. Clause 1 creates the obligation on the Buyer to perform the contract with the customer in place of the Seller. Under this clause the Buyer becomes liable to the customer as if the Buyer had been the original party to the contract; the Buyer will accordingly become liable to the customer for any breaches of the contract by the Seller before the Novation. The Buyer must therefore address separately, e.g. in the agreement between it and the Seller for the sale of the business, the question of liability for any such earlier breach and the Buyer should seek an indemnity from the Seller against any costs, loss or damage arising from it. 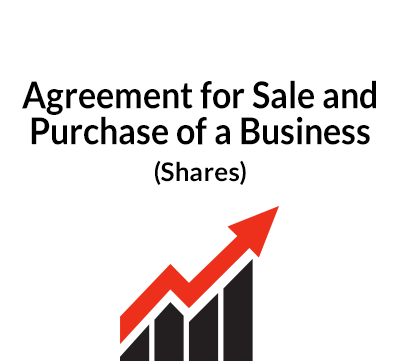 Clause 2 contains the customer’s agreement to release the Seller from its obligations and to accept the Buyer in its place. This clause also contains confirmation from the customer that the customer remains fully bound by the terms of the customer contract. Clause 3 relates to governing law. This will usually be the governing law of the contract. For more information on governing law and jurisdiction, please see our free documents. It is usual for a Seller to write to its customers with a form of Novation Agreement, explaining the reasons for the transaction and asking the customer to sign the Novation Agreement and return it within a specified period. A sample form of letter is attached to these explanatory notes. Sometimes, if there is a dispute between the Seller and a customer, the latter will take the opportunity to withhold signature of the Novation Agreement. Alternatively, the Novation Agreement might contain a clause which resolves the dispute or makes it clear what liability the Buyer is taking on. Under English law it is common for a novation agreement to be executed as a deed. In that case, Alternative B in the signature section should be used instead of Alternative A. It is assumed that all three parties are limited companies. For more information on deeds, see our accompanying Notes on Signing Agreements and Contracts.